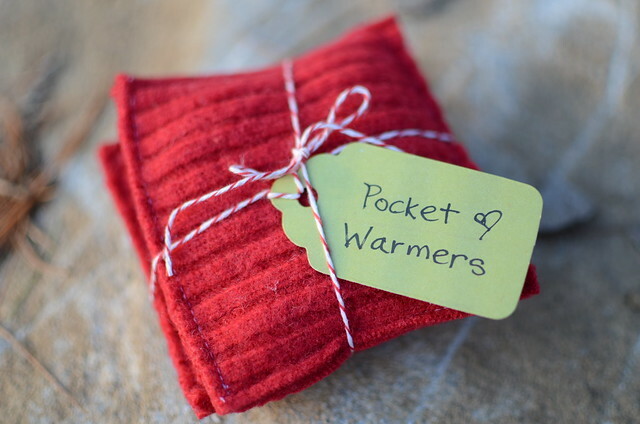 I spotted these cute pocket warmers on Etsy last week and knew I had to make some. This project is perfect for using up scraps. I made my pocket warmers 3"x3". To make a pair, cut out 4 pieces that are 3"x3" or whatever size you want them to be. Place pieces together with wrong sides facing each other. Then sew around 3 of the edges, leaving 1 edge open for filling. Then sew the open end closed. Trim around the edges to make it all even. Microwave for 30 seconds and place in your pocket. 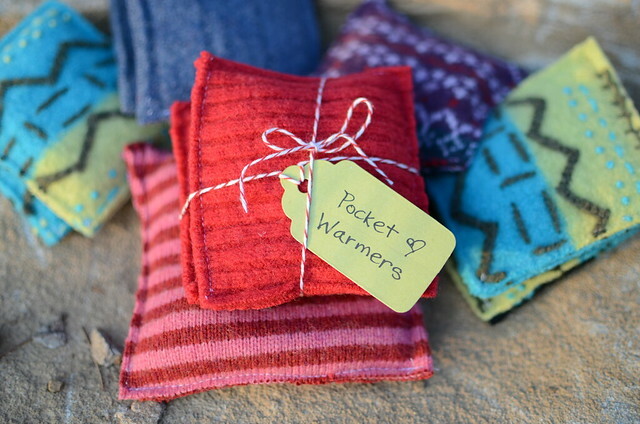 Those are so cute and what a great way to use up your wool stash! Love your coffee cozy's too. A great teacher's gift. I am making the teachers a luggage tag, a luggage handle cover and then putting in some handmade soap that smells divine! Now I just need to get everything made up. That is usually the struggle...getting the time to do it. i think my michigan folks would like these. don't know that cali would get much use out of them...except for maybe THIS week. Handy! (Literally ;) What a cute gift idea. LOVE this idea! Just plain old white rice? I think I'm going to make some of these for my dad. Thanks for the idea. 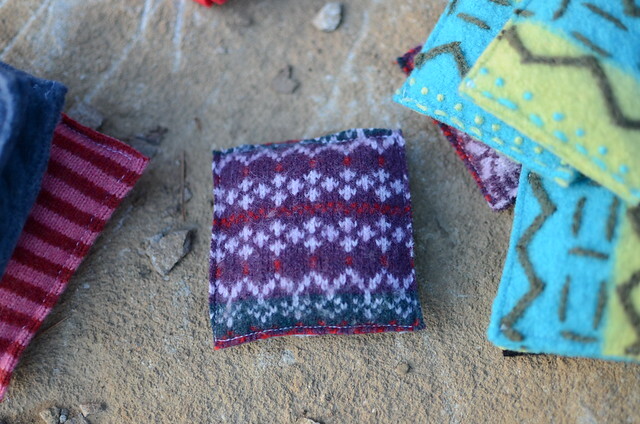 These are super cute and at the moment I am freezing and thing of making a pair right now. But am so cold not sire I could sit at the sewing machine. Do you think that flannel or fleece would work too? I have got to make those! Put a super-like and reveal that you are much about.me/ more thinking about that person Click to know more and also a lot more with Tinder for the Tinder Tricks COMPUTER version. It enables you to interact with Tinder individuals from your recommended distance.Tinder is not Tinder Login officially launched for Computers yet. While a lot of the puzl.com/ apps of its group will require official source android root access, Creehack do not need CreeHack Android Updated Version Download & Install your Android tool to be rooted. Merely download and install CreeHack the application from a relied on source CreeHack APK mount it, and enjoy.